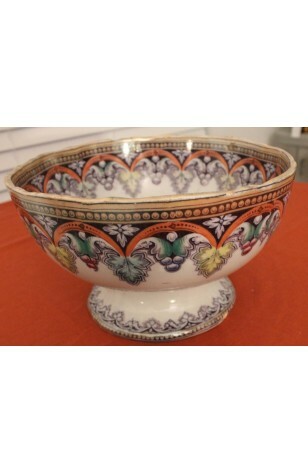 Antique - David Lockhart & Co, Scottish Pottery Footed Punch-Toddy Bowl, Circa 1860's. A Mid-19th Century Punch / Toddy Bowl, made by David Lockhart & Co. in the 1860's. The "Peru" Pattern consists of numerous colors such as, Red, Green, Blue, Black, and Purple, with a Lustre Glazing. The Punch Bowl is showing some Crazing, and age wear, Chip on the Rim (see Pictures), but in overall good condition for a 19th Century Piece of Pottery.